Home » Featured » Leave Me A Rhône! Syrah (also called Shiraz in Australia) is originally from the Rhône Valley in France, but it is grown in many parts of the United States and is becoming one of Australia’s top wines. Syrah (and Shiraz) tends to be a big, full-bodied wine with flavors of blackberry, cherry, green herbs, leather and smoked meat. Try pairing Syrah with hearty dishes, such as roasted lamb, eggplant parmesan, grilled and smoked meats, stew, chili and robust cheeses. Picture Penelope Cruz running naked through a field of wildflowers while eating a slab of cherry pie and you’ve got this wine in a nutshell, er, wine glass. 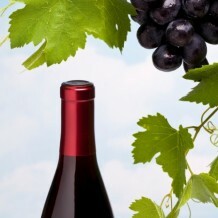 It is medium bodied, spicy and a little racy, with abundant aromas and flavors of cherry, pepper and floral notes. This wine is done in an over-the-top style – it has huge fruit, huge spice and tons of sweet, smoky aromas and flavors, all wrapped up in a huge mouthfeel. It’s Shaq, BBQing ribs with a sweet, smoky sauce in the backyard. Ripe blackberries hang in the background.